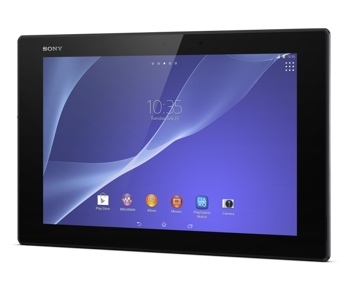 Sony this week announced that its upcoming ultra-slim 10.1” Xperia Z2 Android tablet is currently available for pre-order and will hit the shelves of Sony Stores on May 4, 2014. The high-end Xperia Z2 features a 10.1-inch full HD TRILUMINOS display with Live Color LED, Front Surround audio, an 8-megapixel rear camera and 2.2-megapixel front camera for selfies, 3GB of RAM, a 2.3 GHz Qualcomm quad-core processor and runs the up-to-date Android 4.4 Kit Kat. The device is waterproof and dustproof (IP55/58), so a quick drop in the bathtub or pool shouldn’t take the tab out of commission. The most attractive feature of Sony’s premium tablet is its physical design. The sleek device is only 0.24 inches thick – about 18% thinner than Apple’s ultraslim iPad Air. And at just 15.5 ounces, the Xperia Z2 is lighter as well. The Xperia Z2 is a worthy follow-up to the Sony Xperia Tablet Z, our choice last November for the best large Android tablet. It’s not a perfect device – CNET notes that the Z2’s battery can drain quick and is slow to recharge, and its 1,920 x 1,200 resolution is disappointing for such a large tab. The $500 price tag can be a turnoff considering you can get an iPad for the same price, too. But remember: This is an oversized tablet with solid internals that don’t come cheap. Sony’s tablet will be available in two versions. A 16GB Xperia Z2 retails for $499.99; a larger 32GB version is available for $599.99. To pre-order yours, visit the Sony Store website.